Intelligent Clout is a Los Angeles-based boutique web development company and online marketing agency. We specialize in custom web design, development, application (software) development, and online marketing solutions. Overall, we’d like you to think of us as an online presence company. Our goal is to help you carve out a niche on the crazy little thing called the World Wide Web. 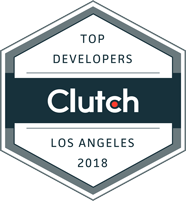 Created in coffee shops of Chicago’s historic Hyde Park neighborhood in 2009 and relocated to Los Angeles in 2013, Intelligent Clout is both local and global company. While our "base" is in Los Angeles, the rest of our team is in Oxford (United Kingdom), operating under the Kartogram brand name. You, our client, get the best of both worlds... American innovation and European flair. Majority of our clients are located in Chicago, Los Angeles, Washington DC, and Miami area. However, due to our flexibility and international presence, we are well-equipped to handle web design and development work anywhere in the world. We’re proud to be an unpretentious, boutique style company. When trying to picture Intelligent Clout, think someone who is too comfortable in a bar or talking to an audience on stage to be called a nerd, but too nerdy and oblivious of the brand of their sneakers to be called a hipster. We are obsessed with our killer work ethics. We prefer substance to fluff and a minimalist, clean approach to anything loud and flashy. Our prices are competitive and we’ll passionately show you why every penny you spend with us will eventually make you a dollar. Thank you for taking the time to check out our website. We look forward to working with you soon!